Jack Matthews was part of a legendary Welsh midfield partnership alongside Bleddyn Williams. The former Newport and Cardiff star Matthews was also a doctor on the 1980 Lions tour of South Africa. 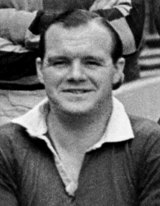 Matthews, who was made an OBE in 2001, played 17 times for Wales and skippered the side against France in Paris in 1951. He was also captain of Cardiff for four seasons. He played six Test matches for the Lions on the 1950 tour of Australia and New Zealand, earning the nick-name "Iron Man" for his crash tackling. His career was curtalied by the Second World War. A General Practitioner by profession he travelled, with the 1980 Lions on their tour of South Africa as the team doctor. Born in Bridgend, South Wales in 1920, Matthews attended Bridgend County School before matriculating to the University College Cardiff. A talented sportsman, in 1937 he won the Welsh AAA junior 220 yards title. A year later, after spending three seasons in the Welsh Secondary Schools rugby team, he played in a senior Wales trail, at just 18. In 1939 he came second in the Senior Men's AAA 100 yards and third in the 220 yards. Matthews continued his connection with sport after retiring from playing rugby. He maintained links with boxing, becoming the medical officer to the Welsh Boxing Association.